This Belle Époque building overlooking Lake Geneva looks like it’s pulled straight out of a fairytale. Long tapestries, chandeliers and frescoes give it a stately and grandiose allure. And, it is. 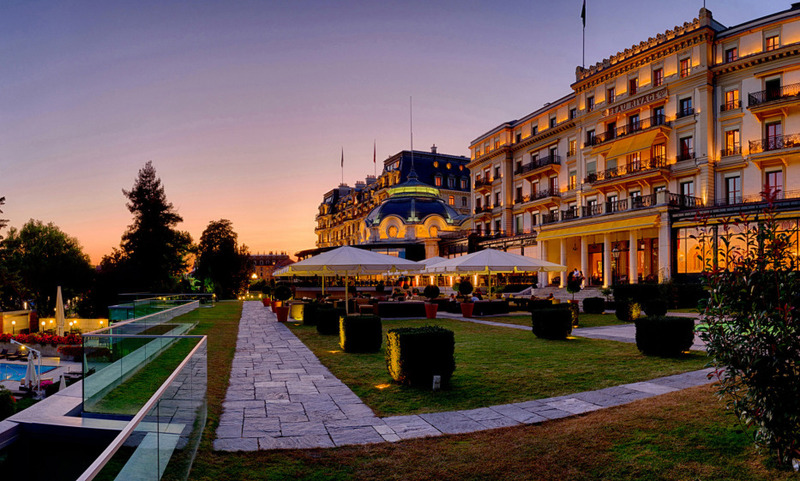 After all, Mussolini signed the Treaty of Lausanne here, and Coco Chanel and Charlie Chaplin swore by it when in Lausagne… The years have passed but the Beau Rivage Palace still retains every bit of its magnificence and panache. One look at the tables at the Anne-Sophie Pic restaurant or guests darting about the common areas is proof enough. Have a delightful dinner at Anne Sophie Pic and try one of the “Emotions” menus that she reinvents each season. Do not miss a cocktail at the lobby lounge terrace with its plush chairs and unrivalled views on the lake. Discover the Spa Cinq Mondes with its sauna, jacuzzi, 15 metre indoor swimming pool or 20 metre outdoor pool ! A truly wonderful hotel, with personal who make us feel so welcome,and cater to our every need ! A special thank you to Edouard Mioche the head of reception for the warmth of his welcome,and his ability to make our stay truly memorable ! Fantastic hotel and will definitely stay on my next visit. The concierge staff was particularly helpful. Very nice hotel, very cozy room. Service very good. We are very satisfied with our stay and will be returning to this hotel with pleasure. An exceptional stay thanks to the friendliness of the management and the room upgrade (to the Suite Malmaison) quality service all around and the Anne Sophie restaurant is without fault. It’s a hotel in a class of its own that delivers authentic luxury. It’s the third time we book this hotel. That’s as good a compliment as they come. A beautifully appointed and managed hotel - with outstanding staff. Wonderful hotel with staff that show remarkable friendliness and effectiveness. This hotel deserves the &quot;Palace&quot; title, everything is beautiful and the staff is very attentive. Beautiful hotel with friendly staff, wonderfully located on the shores of lake Geneva. Probably one of the best hotels in the world. Outstanding service - most of the staff greeted us by name - very unusual these days. Faultless 3 day stay. The only shortcoming - we were charged for parking our car in the hotel car park?? given the price of the room, do they really need to charge me for parking? This hotel combines the luxury of a palace and the sensation of being in a home away from home. You are made to feel comfortable thanks to the highly trained personnel. The service is of high quality and i’ve got nothing negative to say. A real-life sized dream that we would love to go back to every night. Un des plus beaux et meilleurs hotels que je connaisse. Restaurants et service excellents. Suite absolument fantastique ! Merci pour l'upgrading ainsi que pour le bouquet de fleurs et la bonne bouteille de vin à l'occasion de notre anniversaire de mariage. a beautiful hotel with a very friendly and helpful personal, I will come back ! It is a wonderful hotel which I adore staying at. However the check in and check out (bringing the luggage to the taxi was delayed and took several reminders) were not as smoothes on previous occasions. Also the limousine transfer cost from the railway station is CHF 90. This is high value property but the fee for such a short journey is not necessary. very positive. I'll come again. Very beautiful and luxurious renovation, but the refurbishment of the rooms gave much more spaces for the bathrooms that for the dressing area, which is a pity and too small for 2 clients in a double room... even for a short stay. Shame. This hotel is great; a variety of leisure activities on-site, easy parking, very friendly staff, the hotel breathes luxury, impressive breakfast room with view on the lake &amp; Alps. Easy connection to the hotel city centre with a free of charge bus ride, 3-4min. The quality of service in this hotel is excellent friendliness, efficiency, availability ... The hotel, inside and outside is very well maintained. The breakfasts are excellent and the extension of the rotunda is a real success: the place is very pleasant. The Brasserie Beau Rivage is very nice. We had the chance to eat outside under the arcades. The Accademia is less pleasant (less professional service). A real palace, a true moment of happiness. This hotel has it all : tradition, modernity, luxury, friendly staff, fine dining, what could be better! A hotel full of magical frescoes and moldings, a great historical monument with a superb view onto the lake.